Meaning: "Chibi Chibi" literally means little by little but that's not what Chibi Chibi's name means. It just means Chibi Chibi because that's what she says all the time. Chibi Chibi is all sweetness and innocence, lke any very young child she delights in running around and having fun, and always gets herself into mischief. She can only mimic what others say. The reason why she says nothing but "Chibi Chibi" is because the first word she heard someone say on when she arrived on Earth was when Usagi's mom said "Chibi." (manga) She appeared in a park out of nowhere with an umbrella. When her umbrella blew away Usagi gave it back to her . When Usagi got home her Mom was mad at her for forgeting her little sister at the park! Usagi freaked. Nobody could figure out was going on, not even Setsuna! Later, we find out she is Sailor Galaxia's star seed. Before Galaxia became completely possesed by the evil Chaos, she sent her star seed out to find someplace in the galaxy where it could be safe. It found it's way to Earth and to Usagi, where it experienced what a wonderful place Earth could be. 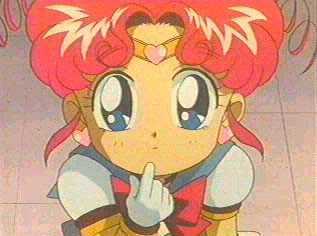 She is not related to Usagi or Chibiusa at all, she just acts like Usagi because she hangs around her so much.